MuvAudio can Free your audio from its limitations. 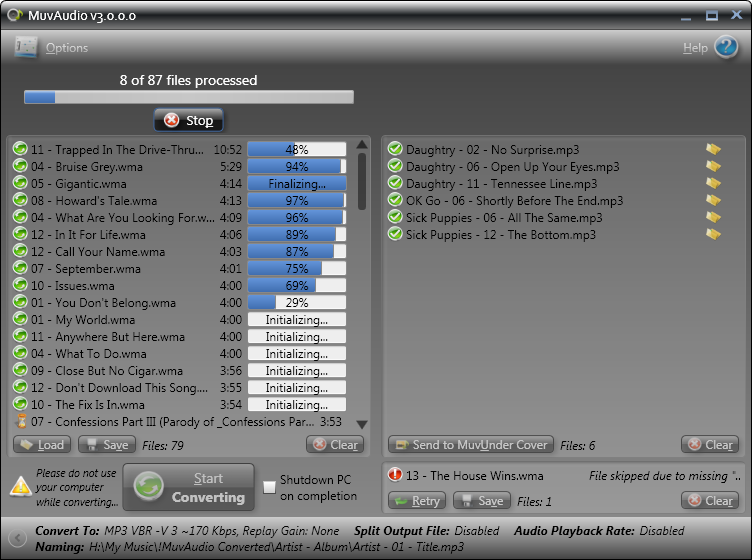 Convert audio files other programs can't into MP3, WMA, OGG, MP4, FLAC, WAV and many other formats. And since it converts your audio files super fast, you can spend less time waiting and more time listening. Because it's your audio and you should be able to listen to it wherever you move.MuvAudio uses a digital conversion process to retain the quality of the original file. *Convert to MP3, WMA, FLAC, OGG, MP4, MPC, WV, WAV. *Transfers all tags from the original file into the converted file, including album artwork covers and lyrics. *MuvAudio takes the guesswork out of audio conversion by supporting all of the major file formats. - MPG, MPEG, M4V, WMV and more! *Split those long audio files into multiple shorter ones! Qweas is providing links to MuvAudio 3.1.2.0 as a courtesy, and makes no representations regarding MuvAudio or any other applications or any information related thereto. Any questions, complaints or claims regarding this application MuvAudio 3.1.2.0 must be directed to the appropriate software vendor. You may click the publisher link of MuvAudio on the top of this page to get more details about the vendor.